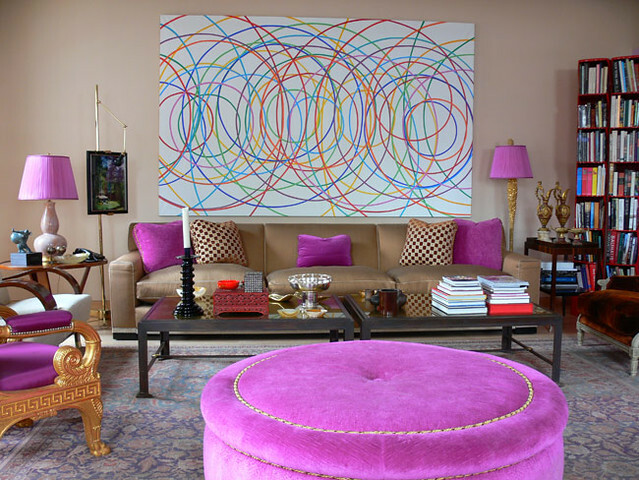 In honor of Mardi Gras/Carnaval, I cornered the Mister of Casa G to give us his thoughts on some rooms styled in the traditional, festive colors of Green, Gold, and Purple. Enjoy! 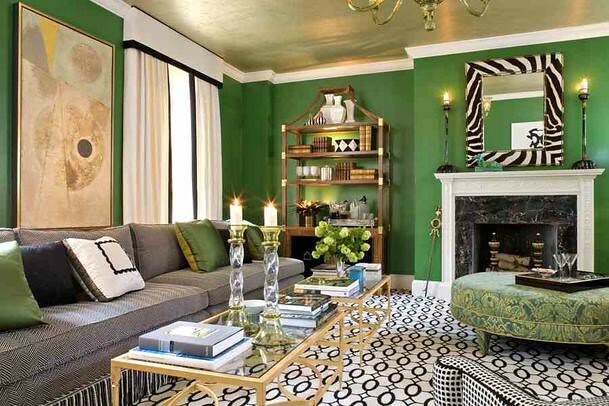 Me: This room actually makes use of two of our featured colors: green AND gold - did you notice that gold ceiling? What d'ya think? Ben: Well, I've been looking at it for over ten minutes, and I still have no feelings whatsoever. Me: What would your first thoughts be if you walked into this room? Ben: Um...Holy S*#t - this room is freakin' GREEN! Does a leprechaun live here? Ben: I think it should have shag carpet? Me: So, you think it's dated? Ben: More that it's over-the-top. That whoever lives there is trying to make "a statement." Me: You know, yellow has been a "trendy" color for the past few years, but I'm still not over it. 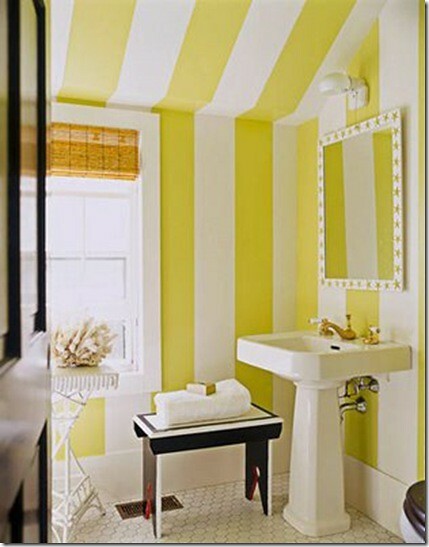 I do love me some good yellow, and this bathroom is cute and clever. Ben: Is my depth perception off? Do you have to straddle the bench to use the sink? Won't water spill over into that floor register? No way. Ben: Three words. Dizzy. Bubble gum. Cotton Candy. Me: Bubble gum AND cotton candy? Ben: Yep, that's all you need to write. I told you, I would not like purple rooms. Me: But, there are some instances where purple does work! Me: I think dining rooms are places where purple can work, and I love the idea of color introduced in a ceiling, but I'm not sure a grapey hue is where you'd go with it. Ben: Well...I'm looking at that large radiator, and thinking this room must get really cold. I would've left the floors natural, and kept a warmer color palette. The purple and gray and white just look icy. Not exactly a place that makes you want to linger over food. Me: Well...that's a good segue...because I think this eating area IS cozy and inviting. Cheery, at the very least. 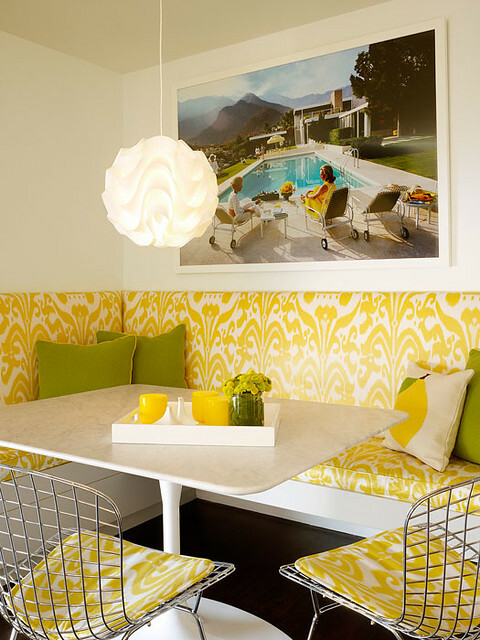 Looks like the banquette fabric is laminated - perfect for kids. I'd actually love to have a spot like this, especially if I had a Slim Aaron's print above it! Ben: Looks very Sixties to me - I like it! Me: Yeah, they went a little Easter egg. Ben: I think it's horrible. The only way you know this isn't a child's room is the bar cart back there. Me: Another case of not quite getting purple right. 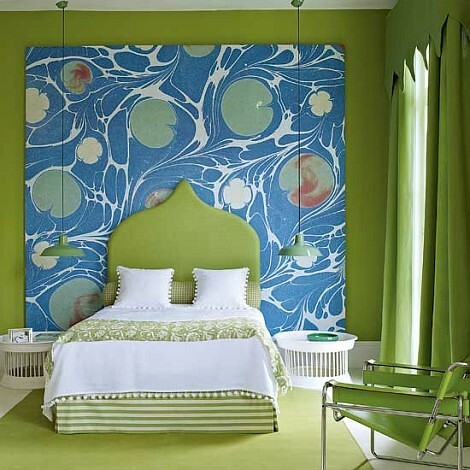 Me: You know, I love green, but this room just goes beyond what I can handle. Me: The valance looks like Kermit's collar! Ben: And that big canvas - lilly pads. Me: Kind of a shame, because the elements alone, I dig - the headboard, the bedding, the pendants in lieu of standard bedside lamps. They just didn't know where to stop. Ben: I think you'd hit those lights with your head all the time. Ben: It says "After" - where's the before? Me: I don't know, I skimped on the source links for this post - sorry, Sources. Ben: Why are there two thermostats? Me: I guess there's a showerhead up there somewhere. Ben: Why? They have that shower nozzle attached to the tub filler. There's no soap dish, no place for shampoo...I'll call it - spend a little more, and do it right. Me: Finally - a good purple. A muted, grayed-down lavender. Ben: I like the floors. Somehow that animal skin also looks purple. Me: Lighting. Great lamp. I loooove that lamp.